Global traffic to heat-not-burn (HnB) websites has been growing steadily since the launch of heated tobacco products by some of the Big Tobacco companies. A new ECigIntelligence report in cooperation with online market intelligence company SimilarWeb reveals that Philip Morris International (PMI)’s IQOS has a dominant position in terms of online traffic in Japan, where the product was first launched in 2015. Nearly 80% of traffic to the IQOS website at present comes from that one country. The product is less successful through online channels in other markets where it is present. While analysis of web traffic data does not directly indicate the level of sales, the report does suggest a strong correlation between web traffic and general interest. On the other hand, our research shows that the consolidated traffic globally to the websites of the three leading HnB brands – IQOS, British American Tobacco (BAT)’s Glo and Japan Tobacco International (JTI)’s Ploom – has been decreasing in the last few months of 2017 after the earlier growth phase of this new product category. The study also analyses paid traffic for IQOS in Japan and Russia and finds that non-IQOS e-commerce websites are using the success of the PMI brand to attract potential new customers. What This Means: This new report shows how the popularity of heated tobacco products has a direct impact online. The traffic was at its highest during the growth phase of the product category, but the report suggests a slowdown in the latter part of 2017. 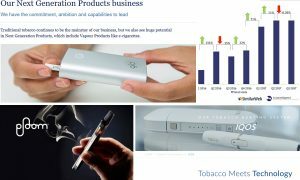 Interest in heated tobacco products – mainly IQOS – translated into increased web traffic to PMI’s official websites but also to e-commerce pages hoping to take advantage of the interest generated by the Big Tobacco companies. In recent months, companies such as PMI and BAT have placed growth in their heated tobacco products high on their agenda, a sure sign of the popularity these new products are enjoying around the world.